Formed in Boston, 2014, ShadowParty comprises members of some of the most iconic electronic bands of a generation, New Order and Devo. At the pulsing heart of the group are Josh Hager, Jeff Friedl, Tom Chapman and Phil Cunningham. For Devo, Hager plays guitars and keyboards, whilst Friedl plays drums; in their hitherto day-job with New Order, Chapman and Cunningham play bass and guitars respectively. “We got on straight away because we had a lot in common, a lot of similar records in our collections – Kraftwerk, early 80s punk bands, electro, Joy Division,” says Tom. “And Josh had one of the Devo plant pot hats in his studio. That was my first question: what’s that? !” With the band's debut long-player, they are joined by diverse collaborators that each contribute a distinct twist to the sound; with combined credentials including work with luminaries spanning A Certain Ratio, Electronic, The Verve and Elbow. Nick McCabe flexes his much-loved guitar sound across two of the album’s tracks, Even So and Marigold. Meanwhile, Denise Johnson lends her soaring vocal presence to no-less-than six of the album’s tracks, including incoming single Celebrate. Also crashing the party is LA-based DJ Whitney Fierce, who appears on backing vocals, and Joe Duddell, the Manchester-based arranger who has lent his orchestral finesse to the likes of Elbow, Blossoms, and New Order; for whom he created and scored a 12-piece synth orchestra for a run of Manchester International Festival shows. It's the sound of a blast. 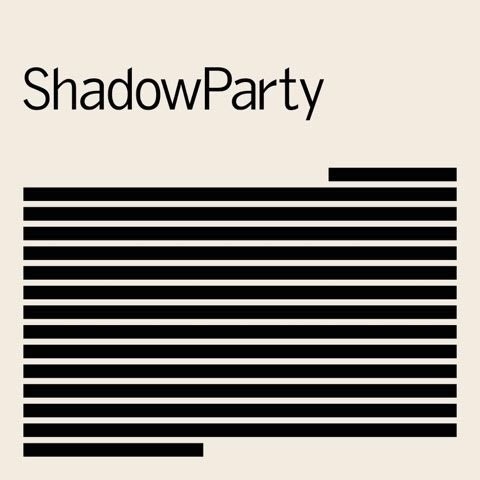 ShadowParty burst through your speakers; pulsing electronics get swept away with lush orchestrations, bold 80s-fused beats get carved up by haunting guitars and vocals tower through each moment, whispering sweet harmonies and unspoken despair. “When you break that mould and you’re open and receptive to each other’s styles, then it kind of opens up an entirely new world.” says Jeff. Signed to Mute, the band’s debut album is now released; it was recorded in Boston, LA, Manchester and, of course, Macclesfield. Turn the lights down. Turn the sound up.